Throughout the 2015 U.S. Open, Roger Federer’s identity with relation to tennis as a whole has changed as quickly as his game. Never before this tournament has it felt like Federer was the latter in a “_______ vs. the field” equation. Even for as great as Novak Djokovic has been this year, which also makes him arguably the best player in the world for the last two to three years, the way that Federer has aged has made it feel like he is still the final boss in a video game. Only by virtue of winning this year’s Wimbledon did it feel like Djokovic reversed that trend. That he did that against Federer, the most dominant Wimbledon competitor of all time, seemed to gain him a certain market share of the popular vote purely out of respect. Eating grass as a mid-match snack didn’t hurt. We all knew he was good, but maybe some of us didn’t know he was this good. But that’s the all-England club, with its all-white dress code and proper tradition. Wimbledon is not Flushing, Queens. An aging great has a knack for getting the crowd on his or her side. We’ve seen it before, with players such as Jack Nicklaus and Alonzo Mourning. When you get to a certain point, no matter your resume, people tend to root for you. Nicklaus had the benefit of playing of his own accord, having won countless titles prior to the 1986 Masters. Mourning, and many like him, did not. Roger Federer, who turned 34 last month, gained the crowd’s favor during his time in Flushing by virtue of his legacy with tennis – which is unquestioned – and his stunning ability to bend when opponents compelled him to break. His meticulous, robotic twirling of the racket captivated audiences and drew them in, like a high-belt prizefighter or Vaudevillian ventriloquist. It wasn’t the mere act of him twirling the racket that did anything; it was the fact that he managed to appeased us all with a simple flick of the wrist and the denial that it had anything to do with his anxiety, or nervousness ahead of the match. Federer began to feed off the crowd, much the same way Andre Agassi did in his intense and incredible run to the 2005 U.S. Open Final, which he, naturally, lost to Federer (that quarterfinal over James Blake is one which I constantly run back in my head, even now). Now, a decade later, Federer was attempting to do the same, generating energy from an otherwise lost and bewildered American crowd, one that had seen Serena Williams lose the previous day. They needed a hero, and, of all people, Roger Federer became the man. Both runs to the Final were exceptionally easy. Federer did not drop a set along the way, and Djokovic only fell in one (to the Spaniard Roberto Baustista Agut). Federer, in fact, won 28 straight sets on his way to the Final, which is like a lay human being rolling through a toll road without paying. Fed was the people’s choice, from the outset. He garnered the crowd’s attention simply by virtue of being there at his age, and Djokovic refused to respond except through his play. Federer gladly picked up the crowd’s favor and used it to his advantage. Reluctant in his disdain for the crowd, Djokovic simply played impeccable tennis. Throughout the final, Federer could not help but twirl his racket. It’s his tick; it’s the thing he does for lack of, I don’t know, smashing his racket against the net and asking for a brief moment to replace it. The way he twirls his racket is serene and mesmerizing. It’s the preferred pre-match routine you would select if you were creating a character on some tennis simulator, and that person had to have a pre-serve defensive routine. Federer knows this. Roger Federer has mastered the intensive art of fading to the background. Brian Phillips has written about this, on several occasions, at Grantland, and he knows a hell of a lot more about tennis and Roger Federer than I will ever claim. The predominant takeaway with his pieces is that he’s right, and that Fed has a way of fading to black that extends gray beyond any previously known shades. Federer knows he isn’t supposed to be here, and yet, he is. The fact that he has appeared in two consecutive major finals speaks to his ability to adjust in the latter stages of his career more than it does to his overall ability, although that obviously plays a part too. It always has. An early slip befell him, but otherwise Djokovic came out swinging in a way to which the average baseball player could never attest. His mastery during the first set revealed a bit of his frustration with being the enemy, which became a theme during the match. Make no mistake: following a year in which he won three majors and was a runner-up in the fourth, Novak Djokovic is unquestionably the finest men’s tennis player in the world, and the way he makes a highlighted sphere appear on television diminishes the abilities of incredibly talented individuals across the planet. Federer was the one with the human race on his side this time, however. This final couldn’t help but shaking the feeling of the 2005 U.S. Open men’s final, when Federer disposed of Agassi in four sets. It felt like someone fighting off the edge of a knowing sunset, one which has experienced the finest yellows, oranges and reds before resting on a deep purple at the pinnacle of a mountaintop. For years, Federer has felt like the deepest purple, destroying any sign of the moon and imploring onlookers to venture back down to the campsite and enjoy the show he was putting on. Federer’s purple may, finally, unfortunately, miserably be fading to black. When Djokovic won the game to make it 5-2 in the fourth set, he invited the crowd to join him in celebration, finally admitting that he had lost their favor but had not given up in his attempts to secure it. He loves New York, he loves Queens, and he is determined to secure approval in the five boroughs, not unlike a basketball player motioning to the crowd in Rucker Park following a city-shaking dunk. Djokovic wants the American adoration, and he yearns for it. In this match, he managed to find it by virtue of the incredible points he won over Federer. Even Djokovic’s outfit represented the negative space of his Wimbledon triumph: he wore a blue shirt which did not stand out noticeably from the court inside Arthur Ashe Stadium. He buys into the ideal he creates for himself to a certain degree, which is compelling from an objective observer’s standpoint as well as from a fan’s. In that regard, it’s impossible to determine whether or not Djokovic feeds into the role of the villain, but he seems reluctant to embrace it. When he won that aforementioned point in the fourth set, it seemed that Djokovic had had enough of being the lesser of meeting forces. Though Federer bested Djokovic in aces, it did not matter. The negative space of the latter vacuumed the presence of the former, consumed in crowd support and the SABR (Sneak Attack By Roger Federer), which, by the way, is something Fed did not invent, and commentators made note of it. Federer’s ability to push Djokovic when serving did not end up mattering either, and that may be the most indicative statistic of the match: Djokovic successfully defended 19 of 23 break points, while Federer was able to defend only seven of thirteen. Djokovic’s ability to turn a poetic Fed serve point into a volleyed break was sublime, and he did not care who knew it. Following the conclusion of the match, Tom Rinaldi asked Federer what it was like to produce such tennis at his age. Before sending a tribute to Flavia Pennetta, who retired upon capturing her first major title over Roberta Vinci, this was his response, which went unlike anyone else’s: “Uhhh, yeah…I feel like it’s moving in the right direction.” If this, ending up in a Grand Slam final, is ‘moving in the right direction,’ then I fear what Fed has in store for men’s tennis players everywhere in 2016. Throughout the tournament, Federer was able to push people’s opinions of his ability. With opponents and observers alike, Federer entrusted a confidence, one which has been seeing the light of day for the past decade and could immeasurably be the greatest ever, at least in the Open era. In the 2015 U.S. Open, Roger Federer was amazing, spellbinding and catastrophic in ways that few of his contemporaries, or anyone in men’s tennis ever, could be. 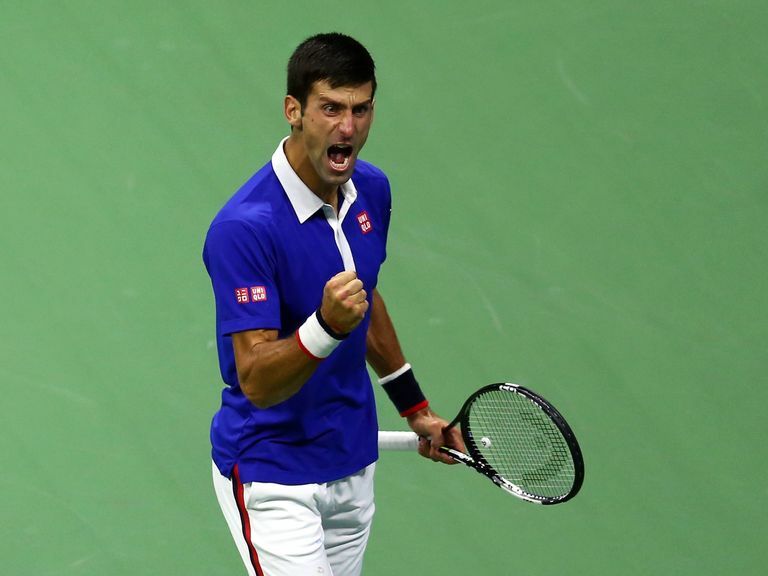 Novak Djokovic, however – the best men’s tennis player alive – was just that much better.